It’s the first attack of its kind targeting Jordan from Syria since the Syrian civil war began. Jordanian army members near the Jordanian-Syrian free zone, close to the main Jaber border crossing in the city of Mafraq, Jordan, in April 2015. Jordan has largely escaped the instability that has swept the Arab world since 2011. 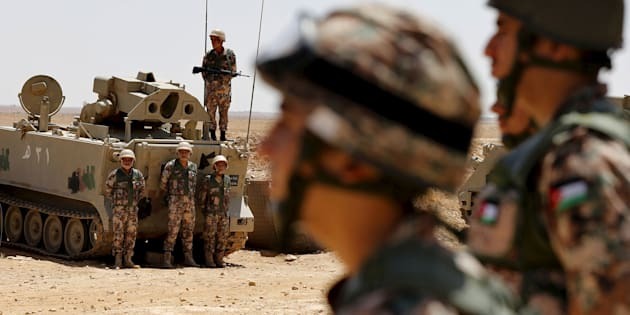 AMMAN (Reuters) -- The U.S. government condemned as a "cowardly terrorist act" a car bomb attack that killed six Jordanian border guards in a military zone near the border with Syria on Tuesday. Washington would continue its support for the Jordanian army, a statement from the U.S. embassy in the kingdom said. The explosives-laden vehicle blew up a few hundred meters from a camp for Syrian refugees in a desolate eastern area of Jordan where the borders of Iraq, Syria and Jordan meet, a Jordanian army statement said. The army said a number of other vehicles used in the attack were destroyed and that 14 other people were wounded in the attack about 5.30 a.m. local time. It was the first attack of its kind targeting Jordan from Syria since Syria's descent into conflict in 2011. It followed an attack on June 6 on a security office near the Jordanian capital Amman in which five people, including three Jordanian intelligence officers, were killed. The incidents have jolted the U.S.-backed Arab kingdom, which has been relatively unscathed by the instability that has swept the Arab world since 2011, including the expansion of Islamic State in Syria and Iraq. Jordan is a staunch ally of the United States and is taking part in the U.S.-led campaign against Islamic State in Syria, where the jihadist group still controls large areas of territory including much of the east. Jordan has kept tight control of its frontier with Syria since the outbreak of the war in its neighbor. The Rakban crossing targeted on Tuesday is a military zone far from any inhabited area, and includes a two-mile stretch of berms built a decade ago to combat smuggling. The rest of the border is heavily guarded by patrols and drones. It is the only area where Jordan still receives Syrian refugees, some 50,000 of whom are stranded in Rakban refugee camp in a de facto no-man's land some 330 km (200 miles) northeast of Amman. Jordan has accepted more than 600,000 U.N.-registered Syrian refugees, but it's resisting the United Nations' calls to take more. The population of the camp has since last year grown from several thousand to over 50,000 people as the fighting in Syria intensified, relief workers say. Jordan has been a big beneficiary of foreign aid because of its efforts to help refugees but has drawn criticism from Western allies and aid agencies over the humanitarian situation at Rakban, diplomats say. Earlier waves of Syrian refugees had an easier time, with some walking just a few hundred meters to cross into Jordan. Jordan sealed those border crossings in 2013. The United Nations refugee agency said late last year Jordan should accept the new wave of refugees -- their numbers have risen, aid officials say, since Russia started air strikes last September -- and move them to established camps closer to Amman.